We have had some fantastic experiences fishing offshore in Lee County. We are currently part of Project Permit for the Bonefish and Tarpon Trust which is sposored by Costa Sunglasses. Come visit SW Florida and charter a Permit tagging charter with Endless Summer Charters. We are ready to take you fishing! On Friday I got to have a day that, as a fishing guide, you would like to have everyday be as epic a day as this one. I got a call from my friend, Sarasota artist and angler Brendon Coudal, who said his friends were in town from Indiana and he and his wife were driving down to meet them. They thought it would be great to let them experience a little of Florida fishing. I thought that was a great idea and we set a date. Fishing with locals for me always seems to set up several challenges. It seems as if Mother Nature knows and throws me a curve ball every time. In this case I lost a bit of sleep the night before knowing this. As if fishing after a big full moon isn’t hard enough we were having a small front move through and another one right behind it. I was sure the conditions weren’t going to be favorable for a good bite but as always I was going to give it my best shot. I picked up my group at the Sanibel Harbor Marriott Resort and made a short run to my best spot for that tide that I knew of. I hooked a live pilchard on a spinning rig, made a cast and handed it to Brendan. From that first cast it was pandemonium for the next 3 hours! At one point we had fish on the deck and fish hooked up. We caught Snook, redfish, big trout and flounder. Schools of big jacks kept coming in giving my anglers quit the work out. I could not have asked for a better day for anyone. This trip will go down as one of my personal best. Great friends, great fishing, and a lifetime of memories. Doesn’t get any better than that. Thank you Brendan for allowing me to guide you, your wife, and friends on Friday. I hope we can make a habit of it! This weeks pressure from local fishing tournaments have made me fish places that we haven’t fish in a while to get away from the crowds. Between tournament anglers and Labor Day weekend warriors it was hard to find a quiet flat or mangrove stretch of island anywhere. We managed find some great fishing right where most were zooming by. With the southeast winds and long out going tides in Pine Island sound, we fished grass flats and hit broken bottom or potholes as we call them and had a wonderful trout and redfish bite with several fish over the slot size in 30 to 36 inch category for redfish and several trout 20 to 25 inches. Snook season opened this weekend but this Captain is going to stand his ground and practice catch and release on that particular species. Even though the snooks comeback has been seen in other areas in great numbers, SW Florida was one of the hardest hit and I still believe the snook needs more time. For now it will be catch and release leaving us with only a great photo and a chance to catch more in the future. They say that March comes in like a lion and out like a lamb. I would have to say the lion ate the lamb this year! We are still getting strong winds and here we are in May! The tarpon are slowly making their migration up the west coast of Florida to The craziness of Boca Grande Pass and beyond. We’ve had a few tarpon hook-ups despite the less than favorable weather conditions. Tarpon fishing offshore is about it right now if you want to get the Silver King. As we begin December with mild temperatures and light winds, fishing in Pine Island sound has never been hotter. Redfish are still in abundance but we are seeing sizes getting smaller as the water temps start to fall. his is the first December that trout have been open in many years and our clients have been limiting out each charter. Snapper and sheepshead also are making appearances and as we move into the colder months ahead we will see sizes increase. Schools of pompano are getting more active on the flats around Sanibel but trout are still the most active in the sound. Nearshore, look for birds to show you the way to Mackerel and Bonito as the offshore bite will also start to heat up this month as well. Have a very Merry Christmas and Happy Hanukkah! 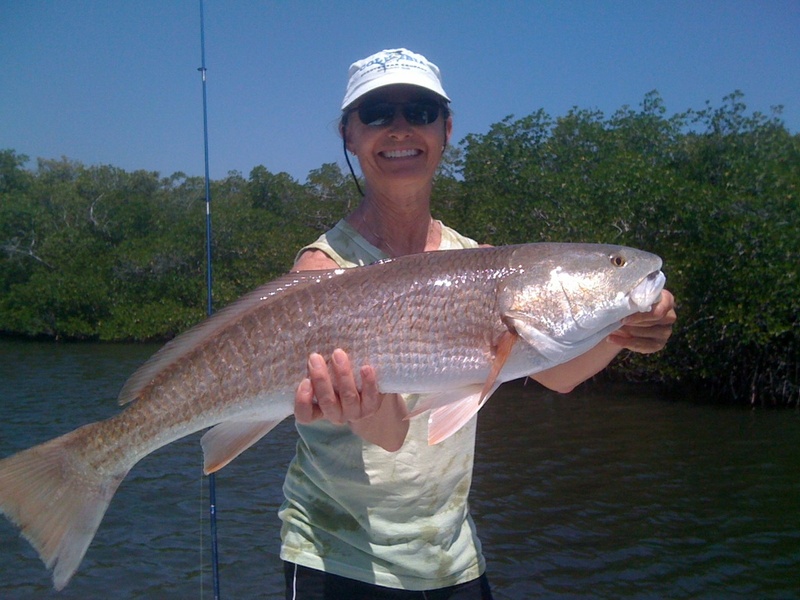 Redfish have been on fire in the Fort Myers and Sanibel areas of Pine Island Sound. Our customers have been tearing it up and for one reason and one reason only…Capt. Bill knows the habits of redfish in SW Florida. Just about every charter with Endless Summer Charters has “limited out” on the redfish bite. This makes for some good eating and happy anglers. We have been sending many of our happy customers to restaurants to have their catch cooked for dinner. We’ve even had a few eat their fresh catch at The Waterfront restaurant on Pine Island while on their charter with Capt. Bill. The chef will prepare a plate full of fried redfish with sides for a nice price too. There is nothing like eating fresh fish just minutes after catching! We will be adding restaurants to this list and hope you come back to see what’s next from the water of SW Florida.